I hope you’re all enjoying your weekend! I’m getting some rest after a crazy week at the office but also getting quite nervous about the conference I’ll be participating in next week, so I needed something to distract me from all this stress and Victoria Kincaid’s new release was the perfect present I could have received for that! Her stories are always so cozy and warm that they make me feel better. There is something special about them and they are always the perfect escape from this crazy world. After having loved A Very Darcy Christmas so much last year, I was eager to get Victoria Kincaid’s new Christmas book in my hands! Luckily for me she didn’t make me wait much longer and had it released a couple of days ago. Today I have the pleasure of hosting her with a guest post and excerpt I hope you all enjoy. Thank you for hosting me, Rita! One of the fun—and sometimes frustrating—aspects of writing Regency romance is that you need to do research to make sure you get the historical details correct. Fairly often this research inspires plot points and sends the story off in new directions. This happened during my research for Christmas at Darcy House. While reading up on Christmas traditions in London, I learned that Astley’s Amphitheatre had special Christmas versions of its show. “Philip Astley was a distinguished soldier who opened a riding school in Lambeth in 1768. Together with his wife Patty, Astley began to exploit the late Georgian fascination with outdoor spectacles by performing horseback tricks and equestrian skills to the paying public. Astley’s displays of horsemanship were gradually complimented by other visual spectacles of strength and skill, such as acrobatics and tight-rope walking. After his original premises were burnt to the ground in the late 18th century, Astley quickly re-established himself by opening his new ‘Royal Amphitheatre’ in 1795, itself rebuilt following a further fire in 1804 (and pictured here). Some scholars credit Astley’s Amphitheatre as being the first circus. Astley was the one who devised the optimal size for a circus ring—he figured out the exact size to create the centrifugal forces that allowed for spectacular feats of riding. 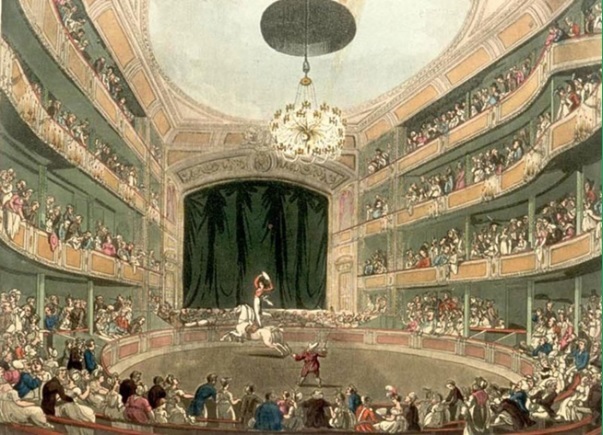 Although acrobatic riding was the first impetus behind the Amphitheatre, it also featured clowns, jugglers, rope tricks, acrobats and other acts. One interesting aspect of the Amphitheatre was that it comprised a circus ring in front of a proscenium stage (as you can see in this picture). Performances took place both in the ring and on the stage—and sometimes both at once. No doubt it was quite spectacular. I couldn’t find any records of what they did differently at the Christmas versions of the show, so in the scene where Darcy and Elizabeth visit Astley’s, I invented some holiday-themed details. Hopefully I came close to the original. We also know that Jane Austen was a fan of Astley’s. In one of her letters she mentions attending the show in London, and in Emma, two of her characters take in the Astley’s spectacular. His arrival had interrupted a scene of some mirth. Wickham was grinning while Elizabeth giggled, and Mrs. Gardiner had her hand over her mouth as if to suppress laughter. When Darcy stepped into the room, the merriment quickly died away. The other man raised his eyes slowly to meet Darcy’s, a smirk forming on his lips. “Darcy,” he drawled. “Wickham.” Darcy bit off the word. Everyone stood to exchange an awkward series of bows and curtsies. Darcy seated himself in the closest available chair, which happened to be opposite Wickham’s. Unfortunately, the other man was also adjacent to the settee where Elizabeth and her aunt were situated. How did Wickham come to be in London? Why was he visiting Elizabeth? Was he actively courting her? Darcy’s breakfast sat like a lump of lead in his stomach. He could not forget Elizabeth’s disappointment that Wickham had not attended the Netherfield Ball and her spirited defense of him during the dancing. The conversation had caused Darcy twinges of anxiety, but he had comforted himself that her meager dowry kept her safe from Wickham’s depredations. In perpetual want of money, the man would never pursue a poor woman. “I was not aware you were in town,” Darcy said pointedly. Three visits already? Perhaps he was courting Elizabeth. The room was too warm and too close. Sweat dampened the back of Darcy’s cravat, and he tugged to loosen it. It was unfair that providence had gifted Wickham with such pleasing manners and easy ways with people. He readily formed friendships while Darcy struggled simply to say appropriate words in social situations. Darcy suppressed a desire to shout that he knew very well where Lambton was. “We have many acquaintances in common,” she continued. Darcy no doubt had acquaintances in common with Mrs. Gardiner as well; unfortunately, they most likely took the form of having patronized the shops that members of her family operated. How have I arrived at this pass? His feelings for Elizabeth had brought him so low that he was beginning to regret his superior birth. “I grew up at Pemberley,” Darcy said. So she had rarely discussed Darcy with her aunt, and yet Wickham arrived for frequent visits. Darcy had the distinct impression he was losing a footrace he had not known he was running. For the rest of the visit, Darcy remained an outsider. Elizabeth knew how Wickham liked his tea. Mrs. Gardiner inquired after his cousin’s health. Wickham referred to incidents which had occurred at Longbourn after Darcy had left for London. Darcy made only occasional forays into the conversation, but his subjects were not taken up by the others. In desperation, he blurted out an invitation for Elizabeth to join him for a curricle ride through London. Nevertheless, Darcy refused to quit the drawing room and leave Wickham in possession of the battlefield. To do so would not only admit defeat but would also leave Elizabeth unprotected from the other man’s whims. As a result, both men stayed quite a bit longer than was customary. Finally, Mrs. Gardiner announced she felt a headache developing; both Darcy and Wickham regarded that as an invitation to depart. Did you enjoy the excerpt? And did the blurb get into you? Well, you have an opportunity to read this book quite soon because Victoria Kincaid is offering one ebook of Christmas at Darcy House to one of my readers. All you have to do is comment on this post and let us know what you think of Victoria’s most recent release. After reading the excerpt, I can not wait to read the whole story! Hi Megan, Thanks for your interest and good luck with the giveaway! I am a big fan of Victoria’s books and this excerpt and the blurb left me really eager to read more. Poor Darcy, to be in such a situation where he sees Wickham courting Elizabeth!! It is so bad when he manages to ingratiate himself to her! But I am sure it will be solved in the best way with lots of romance for ODC. Thank you for the giveaway! Hi Daniela, Yes, don’t worry there’s lots of romance for ODC and an HEA. Good luck with the giveaway! Yes, Darcy has a hard time! But everything turns out for the best. Good luck with the giveaway! Enjoyed the excerpt but felt bad for Mr Darcy. I hope that Mr Wickham’s true character is revealed before Elizabeth forms a strong attachment to him as they seem to be close here. Yes, Darcy is in a tough situation, but it all works out in the end! I have read and enjoyed other books by Victoria and would love a chance to read this. Thanks. Hi Sheila, Thank you for being a faithful reader! Good luck with the giveaway. What a different scene! Wickham at the Gardiner’s!I don’t like this one bit! So I have to find out what happens. Thank you for the giveaway and for the change from the same old same old. Hi Sally, Yes, there were times when it was painful to write this kind of scene. 😦 Good luck with the giveaway! Hi Vesper, He is useful that way! Good luck with the giveaway! Oh,my! Elizabeth journey to the Gardiners’ for Christmas only to be met with not one,but two potential suitors vying for her attention. I can well imagine Wickham conversing sweetly with Mrs Gardiner,while Darcy,tongue tied with anxiety and inner turmoil Fahd his feelings for Elizabeth,sits by watching,a participator in a game he had no desire to play. Yes,the excerpt was just what we needed to whet our appetites and increase our anticipation!! Best of luck with your new book,Victoria. Rita,thank you for such a lovely post! Hi Mary, I’m glad you found the excerpt intriguing. Good luck with the giveaway! I have already commented but I was just wondering … why would Wickham offer for Elizabeth? She has no dowry or connections, unless he plans to seduce her and leave her? Very curious!! Hi Claire, Yes, the prospect of Elizabeth with Wickham is pretty alarming! I believe i know why Wickham is proposing to Elizabeth and really hope she doesn’t accept him. I feel so sorry for Darcy trying to compete. Surely Elizabeth can see how smug and sly Wickham is. I hope she starts to see the truth soon and that Wickham gets his just desserts (as well as the person who persuaded him to pursue Elizabeth). Good luck with your conference Rita. Hi Glynis, it sounds like you might be guessing right. 🙂 Wickham does get his just desserts. Good luck with the giveaway! Really liked the excerpt. Nice little touches of humor. Looking forward to reading the whole story. Thanks for the giveaway. I’m glad you enjoyed the excerpt! Good luck with the giveaway. What is Wickham up to? I am definitely intrigued! Thank you for a chance at the giveaway and good luck Rita next week! You will be amazing! Hi Carole, I’m glad you found it interesting. Good luck with the giveaway! Hi Rita, Thanks for having me visit! I’m sure you’ll be terrific at the conference. Having been to a JASNA conference, I think Jane Austen lovers are some of the warmest, friendliest people I’ve ever met. I bet they’ll be a great audience for you. Dang Wickham… I want to shake him into next Christmas. I also want to shake Lizzy. Doesn’t Mrs. Gardiner know anything about Wickham? Maybe she’ll write to someone in Lambton and ask? No? Maybe they don’t do that. Aarrgghh! ! I’ve got to know what happens. Thanks to Rita for hosting this aggravation…em… post. Thanks to our author for shooting my blood pressure through the roof. I don’t need to sleep tonight. LOL!! Blessings on the launch of this book and good luck to all those who want a copy. I certainly do. What fun!! Reading the comments…Wickham has a reason for proposing to Elizabeth…she with no money and no connections? That alone is a reason to read this! Sounds like a lovely story, with so much torment for Darcy and a chance for Elizabeth to choose the truly worthy man of the two. The idea of a Christmas themed show at Astley’s sounds really a treat! I am rather frightened of ickham who goes to the trouble of following Lizzie to London. I am hoping Darcy speaks up to Mr. Gardiner, or Mrs. Gardiner hears from her contacts about Wickham. Oh, what angst! I could very much sense how Darcy probably felt like he was desperately treading water there. I look forward to reading more, especially about why Wickham proposes. I can’t imagine one of Victoria’s stories being anything but enjoyable. Loved the excerpt (except for Wickham, of course)! Looking forward to reading this one! Thanks for the chance to win a copy. A sword to my heart!!! Darcy without Elizabeth! Oh, can’t wait to see how this I sorted! So exciting! I enjoy reading Victoria’s books and am looking forward to a nice Christmas-y one. It was a funny scene, though I don’t think that Darcy was amused. Congratulations on the release of your new book. Thanks for the giveaway. The problem I always have with giveaways is that I am so impatient to read the story after the excerpt that I don’t know if I can wait until the 16th! lol But, I will wait… then jump on it on the 17th if I don’t win! I am definitely intrigued by the blurb and delicious excerpt. It looks like Darcy is at a disadvantage as no one will help his cause of pursuing Elizabeth, not even Mrs Gardiner. Btw, the cover is lovely, Victoria.